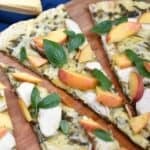 Sweet peaches, smokey Gouda and a grilled pizza crust combine to make an amazing Grilled Chicken and Peach Pesto Pizza that everyone will love! Prepare a batch of Basil Pesto or purchase a jar at the grocery store. Spray or brush the chicken breasts with olive oil, and season with sea salt and pepper. Place the chicken breasts on the grill and cook until the internal temperature reaches 165 degrees. Remove from the grill and set aside to rest before slicing or shredding. Slide the pizza dough onto the grill. Cover and cook for 2 minutes. Flip the pizza over, then remove from the grill. Spread the pesto over the grilled side of the pizza crust. Sprinkle the shredded cheese over the top, then add the chicken slices (or shredded chicken). Return to the grill, cover and cook for 3 to 4 minutes until the cheese is melted and the crust is crisp. Remove from the grill and top with sliced peaches and fresh basil leaves. Slice and serve immediately. Repeat as many times as needed for additional pizzas. The recipe is written for one pizza to simplify the instructions. Adjust the serving size to “8” to make 2 pizzas. Do not overstretch your dough to make a larger pizza, it will be too thin and it will burn. Make the Italian Pizza Dough up to 3 days in advance, wrap with plastic wrap and store in the refrigerator. Allow to warm up on the counter before using. Make sure you sprinkle your pizza peel with cornmeal to keep the dough from sticking.